Whether it be PCs or laptops, we offer special services for home users to clean and protect your computer from viruses and spyware. Visit the Free Software section of our website for a variety of approved and truly FREE tools. PC and Network Audit - I will come out to your business and perform a complete audit of your site. I'll give you the facts on what your network and computers need to run at their very best, ultimately saving you money! I'll check a number of health indicators to diagnose potential problems in the future..
We offer both on-site and remote support services as well as 24X7 support. You can call us day or night. We're here to help you when you need us most. 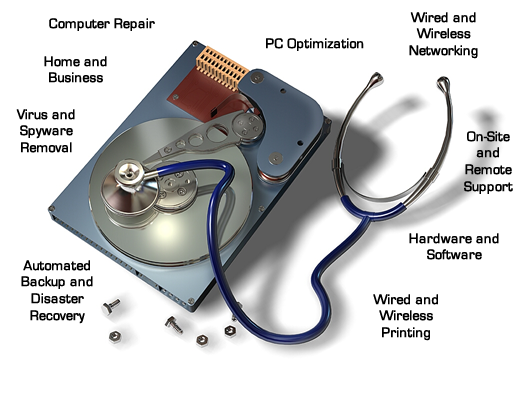 Virus removal, hardware upgrades, backup solutions, and PC optimization... we do it all. No surprises either. We'll quote you a price before we start.